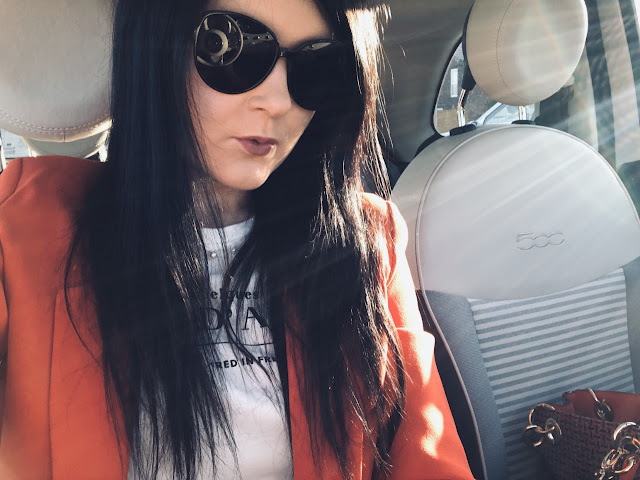 So darlings, it has been a little while since I have exposed the contents of my bag and with Summer in full flow it's time to switch up a few of our items to ensure we are always embracing the finest SS15 style and are prepared for every occasion. This season I am using my houndstooth Michael Kors tote bag (SHOP SIMILAR). 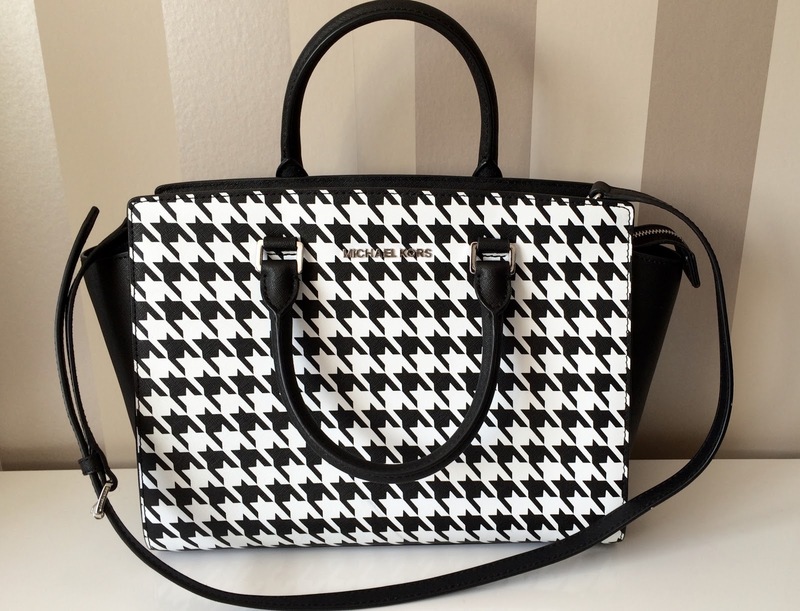 I am obsessed with monochrome, as you may know and adore the shape and size of this bag. 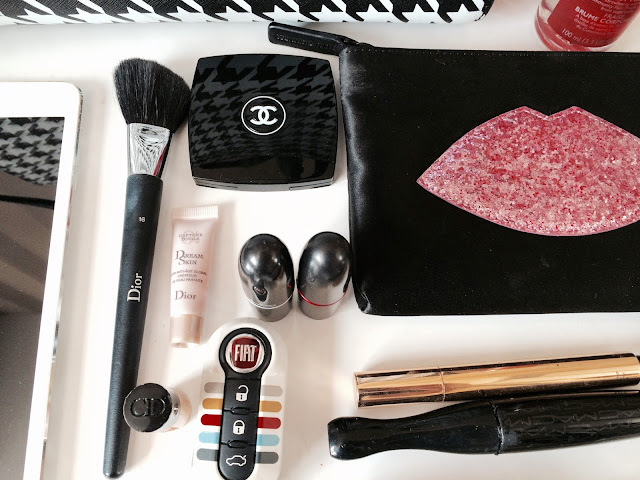 I also carry my favourite Lulu Guinness (SHOP SIMILAR) embellished lip pouch to store all my make up essentials in. Whilst Body Shop Strawberry mist (SHOP) is this weeks choice of scent I like to switch this up regularly, often choosing Victoria's Secret Pink Sprays as they remain my favourite. 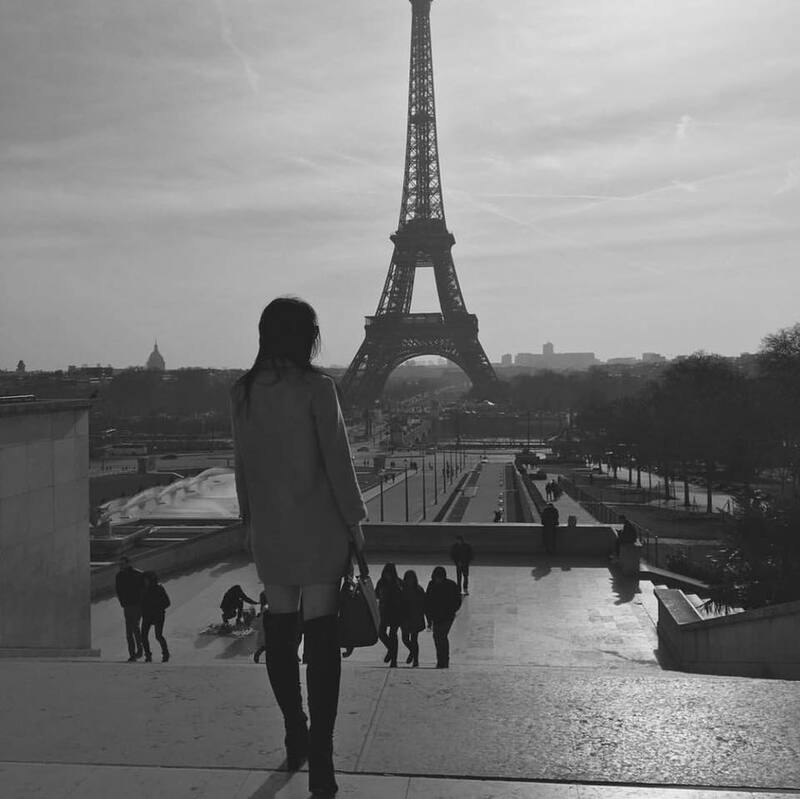 Being a blogger and meeting the demands of city life it is extremely important that I am not only up to date with everything but have easy access to the internet and ultimately the world. Alongside carrying my phone I take my iPad mini (SHOP) everywhere, it is the perfect handbag size and I can I always ensure that everything is fully charged by using my juice cube for when the battery dies (SHOP). This is also of great importance as it allows me to blog on the go, especially when I travel. I have had my Ted Baker purse for around four years now and I am just far too attached to let it go. I cannot recommend Ted Baker purses enough. The variation of colours that they are available in are so chic and forever changing to adapt with the hottest trends of the season (SHOP SIMILAR). I also carry my Orla Kiely diary everywhere. I have often struggled to find a planner that isn't too large and heavy as they tend to weigh my handbag down a lot (SHOP SIMILAR). My Chanel compact is perhaps my favourite accessory to carry (SHOP). Everyone knows how important touch ups are throughout the day which is why it is essential that I also carry my mini Dior dream serum and foundation (SHOP). Instead of carrying my full size glass bottles around I refill tester bottles for both. You will also spot my favourite Dior brush in number sixteen that I use for my blusher and bronzer (SHOP). I also carry my Lancome Touch Eclat (SHOP) with me because everyone knows this is a make up bag essential. At the moment I am using MAC 3D lash mascara (SHOP) and although it isn't my favourite it most certainly adds length and definition to my lashes. Most importantly you will find my two favourite MAC lipsticks one for daywear and one for when things get a little sassier. Creme cup (SHOP) is my all time favourite but I am currently using Miley Viva Glam in Amplified (SHOP) as my go to glam product. I always carry sunglasses with me as I have super sensitive eyes meaning my eye make up often runs as soon as I go outdoors. These kitty eye glasses are courtesy of River Island, they always make the best in my opinion. I change my glasses far too often to choose a favourite pair (SHOP). Finally you will see my Urban Decay NAKED flushed palette (SHOP). Although I wear Benefit Candy Shop variations for my everyday make up look I find this palette perfect to carry around, it's cute and compact plus Urban Decay skin products are fabulous. What are your thoughts darlings? 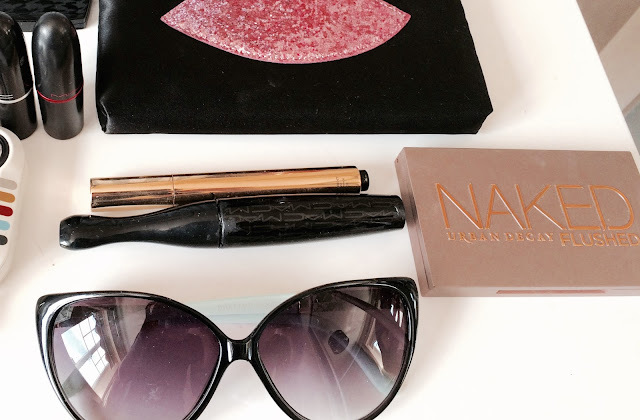 What other items do you consider your daily must haves?